There has been a lot of chatter about Czech nymphing with fixed line rigs in the reading I have done in the last two months. I actually have two rods that are recommended for this method, the Daiwa Kiyose SF 30 and a Suntech Genryu Sawanobori 45. Due to high water flows in the Boise River, three of my favorite spots have been reduced to water too deep for the way I used to fish them. So for the past two weeks I have been Czech nymphing. This isn't an unfamiliar method as I have a fly rod setup for this type of fishing, and fished this method for years on the Umpqua River in Oregon. On Chris' recommendation, I bought a Nissin Kyogi 21 (630 centimeter rod) for Steelhead fishing. I enjoyed this rod so much for its smoothness, that I then bought a Kyogi 18 (540 centimeters) for carp fishing. When the water is lower on the Snake River the carp come up on the flats by the 100's and I knew the 18 would be the perfect rod for it, but the water is still too high for fishing the flats. One other fun place to fish for carp is in the flooded woods of Lake Lowell near my house. I knew I needed even a shorter rod so I special ordered a Kyogi 12 (360 centimeter rod). I wrote an earlier review of the rod, more like "first impressions" a while ago. On my friend's private bass pond, I experimented with the Kyogi 18, and found that even though these rods are rated 4x-0x tippet, they will protect a 6x tippet well. I had no break offs with 6x. I had about a 25% break off with 7x. So what I realized is that these rods could be fished with 7x in a pinch. I have caught several 3-5 pound carp with the Kyogi 12, but that isn't the focus of this report. Due to the high flow of water through Lake Lowell, the carp aren't up in the trees yet. The water is too cold. I went to one of my favorite runs on the Boise River with the Suntech Genryu Sawanobori 45 and really couldn't wade out far enough to effectively use that long of a rod. I caught a couple of 12-14 inch brown trout that day. When I got home I thought for one of the few times, "I really need a shorter rod." The next time out I took the Kyogi 12. If you look around this website and the Tenkara World, a 360 centimeter rod seems to be the standard length. Under 360 is considered a short rod. Over 390 is considered a long rod. So the Kyogi 12 is right in the sweet spot, and I am beginning to understand why because a 360-390 rod is so controllable. I used a 4.5 level line almost the length of my rod, an 18 inch TenkaraBum sighter, and 18 inches of 5x tippet for my first two times Czech nymphing with this rig. I used my typical two fly setup. The first time out I caught several 6-12 inch trout and two smallmouth bass about 16 inches. I thought about doing a write-up, but I was wanting some big fish! The second time out I caught two brown trout both about 15 inches and one nice rainbow. Early this morning, I went out with the line Chris recommends. I used -2x fluorocarbon tippet for my line (equal to level line 4), 18 inches of sighter line and 5x tippet. I also put on a couple of yarn markers because of the depth of the run. I caught one 6 inch Brown trout this morning and two 16 inch smallmouth bass. It was the 6 inch brownie that prompted me to write up this report about the Kyogi 12. Here is a rod that is rated to handle 13.2 pound tippet, but is sensitive enough to clearly detect the strike of a 6 inch fish in the bottom of a run that was over 6 feet deep! The Kyogi 12 weighs 3.5 ounces. It isn't a heavy rod. It is no light weight either. It casts one handed well. It isn't a shortened 18 or 21, but is its own design. The sections are a little shorter than the 18 and 21. It is a long rod when collapsed however. There are only 4 sections. I emailed Chris to see if he had fished with a Kyogi 12. I was hoping for some more perspective and insights. He has not fished a Kyogi 12. In my limited experience at fixed line fishing, but a veteran of 20 years of deep nymph fly fishing the Kyogi 12 is an amazing rod for getting a nymph deep, and having the sensitivity as well as the power to handle the fish. I haven't used any of the other "carp rods," I really wish they didn't have that label. I special ordered the Kyogi 12 with a specific purpose in mind. What I have discovered is that this rod is a hidden gem of versatility. I can fish a size 3 level line with a 7x tippet for small fish up to the line I use for steelhead with a 0x tippet. 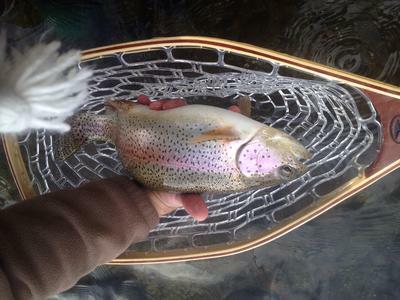 A happy size for nymph fishing is a 4.5 level line with 5x tippet. Chris can special order a Kyogi 12 for you. He even got me one in my favoite color - yellow. Personally, I think he ought to carry this rod! If a big fish breaks me off, I can always go bigger with this rod! Comments for Turning to the "Deepside"!! Cool fish, Les. Looks like fun! Nice write-up, too. Keep up the good work. Get the 21 for Ma-Ma-Max Headroom. Actually that was the problem with my longer rod, the trees growing over the water wouldn't allow for a good cast into the channels, and they are currently too deep to wade over to the sand and rock bars in the middle where I like to go and cast back toward the shore. The Kyogi 12 is short enough to get a great drift through the seams under the trees. I really am thinking about adding a Kyogi 15 (450 CM) to my arsenal, then I would have all the bases covered and the complete set, 360 CM; 450 CM; 540 CM; and 630 CM. I think I would order it in Red. I would then have a Yellow, Red, Yellow, Red set! It is hard to justify when the Suntech Genryu Sawanobori 45 is such a great rod. Allan - A four pound carp on a 11'11" rod is an amazing battle! I kept him out of the brush, but the first run toward the middle of the lake had me fishing two handed and not really caring if the tippet (1x) broke or not! He didn't come close to maxing out the Kyogi 12, but with that short of a rod, it was a close quarter battle, and his last tactic was to swim right at me, but I was able to keep the tension on! The circle hooks Chris sells with 4 red wigglers was my choice for enticing the strike and ensuing battle! Next time out I will be taking my waterproof camera. I really could have used the headroom of the 21! That said, it put a smile on my face! Q from spouse: "How many rods do you actually need ?" A: always the same - "just one more"
If rods are an addiction what does this make Chris? Would you consider telling about your experience with steelheads on tenkara? I wrote up my experience back in April on Steelhead fishing. I am not sure how far back you can scroll on this blog. Hopefully you can scroll back that far. On the navigation bar on the left side of the page, click on Your Gear Reviews. On that page, search for steelhead. The title of the article is Steelheading on the Salmon River.